Dedicated staff at a Coalpit Heath-based charity saw their hard work rewarded with two special presentations. A cheque for £1,000 from the Gloucestershire Freemasons was presented to Paul’s Place founder Kath Aldom whilst her years of work for the charity saw her presented with two special gifts by the outgoing High Sheriff of Gloucestershire. Freemasons have donated £12,000 to the Midlands Air Ambulance Charity. 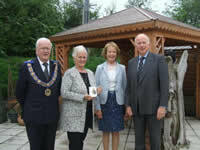 The funding was jointly made by the heads of mason groups in Worcestershire, Herefordshire and Gloucestershire at a short ceremony at the charity’s headquarters in Strensham. Freemasons have donated £1,000 to the West of England MS Therapy Centre in Bradley Stoke.Members of the Gloucester Masonic charity Action presented the money to Terri McDonald, head of fundraising at the centre in Wheatfield Drive. Popular funeral director David Mason has died aged 85. He was a regular visitor to our Lodge, the last one a few months prior to his death and he will be sadly missed by all members of the Mythe Lodge as well as the wider Masonic population in general. Our condolences go to his family.